ay happen during the pool round and again in the direct elimination (D.E.) round. When two teammates fence one another in competition, the coach will NOT coach either fencer. Instead, they will go to another bout or step away from the match. This is our policy and the policy in the majority of fencing clubs. Our coaches are very interested in the outcome of ALL our fencers. We do not want one teammate to feel a coach favored one fencer over another. We sometimes see parents or friends jump in, assume the role of coach and start strip coaching their child or friend. Please do NOT do this if one teammate is fencing another. For the same reason that our coaches don’t strip coach during a teammates bout, parents and supporters should not be doing the same thing either. You can best help your fencer by watching and enjoying the match. During the one minute break of a direct elimination match ONE person only, can hand the fencer their drink. If you do, please do not give any coaching advice. General comments like “remember to breathe”, “be ready”, or “think about it”,”try your best”, is about all you want to say. It’s best if your fencer has their drink ready and learn to rely on themselves only. NO Cheering AGAINST teammates. Whether you are a parent, sibling, spouse or a friend, cheering one teammate against another is against club policy, even if the fencers are from a different club (if the fencers are teammates at a different club). Cheering against people who are teammates (especially your teammates) bothers both fencers and takes away from a good tournament experience. Most fencers cannot hear strangers who cheer for their opponent, but hearing and seeing familiar faces and voices cheering for the opponent is very distracting, can be confusing and can be taken personally. Cheering teammates on against each other is just bad sportsmanship. Teammates have to train and practice together. It’s very much like a family. Just like you would not cheer one sibling on against another, we don’t cheer for one teammate against another. 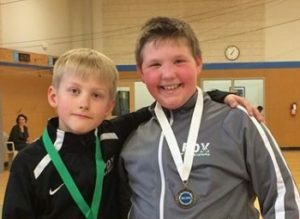 It can be uncomfortable when your child or fencer has to fence a teammate and friend. It’s even more stressful if you are cheering against their friend and teammate. The fencers have to learn how to compete in the club against each other and remain friends. 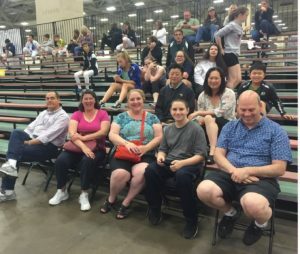 When the fencers are young children, having a friend’s parent or family cheering against them is extremely distracting, causes them to lose focus and wonder why the parent doesn’t like them, they can take it very personally. Trust in them and their training to handle it. Ultimately the winner will be decided by their own actions, preparation, skill and experience. You’ll be modeling and teaching them valuable life skills about how to treat and value other people. An equally valuable lesson is that you trust they can handle the situation on their own, helping to grow their self confidence. claim it was a wonderful locate. Many thanks!